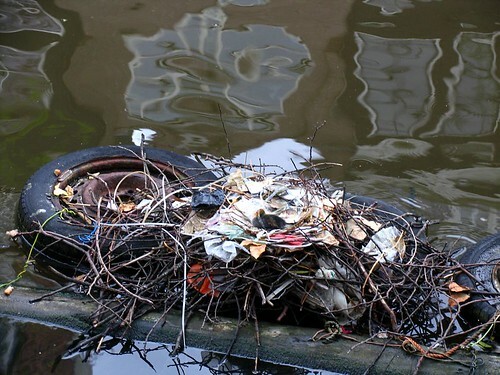 Cycling along the Egelantiersgracht (see it on a map) this morning, I spotted some people pointing to a coot’s nest built upon some old, floating car tires. Mother coot had apparently left the building. What’s more: she had taken all her offspring along but for one tiny, wretched baby coot (a ‘zieligje the Dutch would call her). This one had to fend for herself. I walked over to the other side of the canal to get a better look. Baby Coot made heartwrenching beep-beep sounds. The assembled residents were quite upset because a bunch of seagulls plus the local grey heron were eying pitiful cootie. They were swarming around her like regular raptors. Now, you may ask yourself: do seagulls and herons eat baby coots? Well, the only answer to that one is: this is Amsterdam. Everyone knew the heron. His name was Gijs. 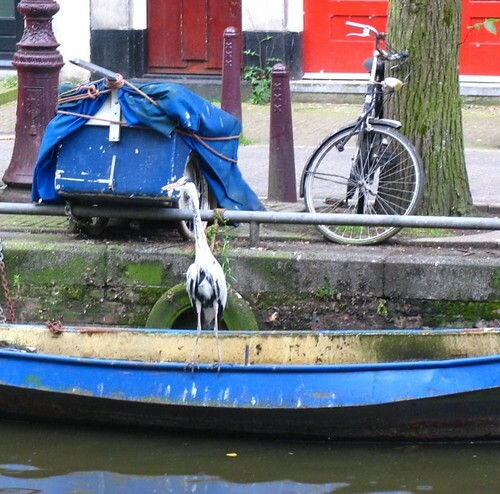 He never goes anywhere but the Egelantiersgracht, the neighbors told me. But anyway, what to do? Some lady talked about taking Baby Coot home. Another raised the option of bringing her to a birdrescue organisation. 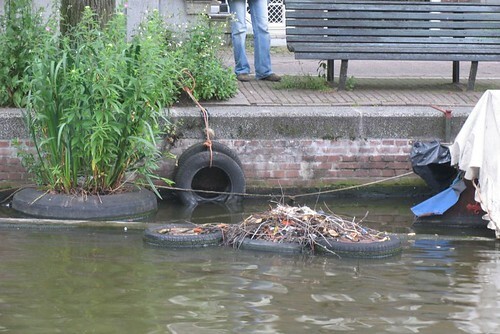 Problem was however that the nest was hard to get to without a boat. And where are those people with boats when you need ’em? I had an appointment and I was already late, so I had to leave this gutwrenching scene. But it’s not difficult to imagine what happened to Baby Coot. I live in Florida…great blue herons often snack on baby birds, along with otters and turtles. I used to feed the ducks in my back yard and watch the herons pick them off like candy. The first time I found this out, a bunch of ducklings were happily eating seed while the heron was perched my roof. Suddenly without warning he dove down, landed, plucked up a duckling and flew away with the duckling still peeping away. You get used to it. Horrible. 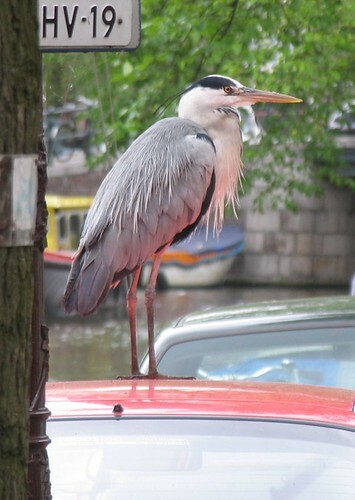 I always thought of herons eating fish, never imagined them to be some sort of cannibals. the truth is, Mr heron isn’t evil. just hungry. but seen from the human eye its a tragidy you cant bring yourself to accept! nature isnt biased; even the cute ones get eaten. maybe the coot chick was gonna grow up to be an evil coot anyway!